Today I’ve been working on a “Early Warning” workflow designed with SharePoint Designer. It is supposed to run on every item change and to suspend itself until few days before item’s expiry date (it’s just a date column). But, it didn’t work as expected. I remembered reading that there are some glitches in the way Workflow Foundation dehydrates and rehydrates the “sleeping” workflows. There is a patch available at http://www.microsoft.com/downloads/details.aspx?FamilyID=6096ce0f-d21e-47ac-afe2-d4e1c2fce670&displaylang=en. I downloaded it and it worked like a charm! Exciting news! The CKS 2.0 has been pre-released. It’s just been a few months since the project started and we already have something tangible. Download any of the components above and play with them (not in production environment, though)…and, above all, provide feedback to the team. Full announcement can be found here. Few months ago I joined Community Kit for SharePoint team. It’s a collaborative open-source effort to extend and adapt SharePoint for different communities. This project is led by Lawrence Liu, Senior Technical Product Manager and Community Lead at Microsoft (his blog runs on SharePoint). It’s hosted on CodePlex, at http://www.codeplex.com/CKS. I’m collaborating in Corporate Intranet and Internet/Extranet edition as a developer. I’ll publish news from this project on a regular basis. Stay tuned for much more free releases from CKS project very soon. If you would like to contribute, please visit the project page and see where you can help. I’m annoyed by many little details of the SharePoint Designer Workflow editor, but the main one is that it profligates in the creation of content types. 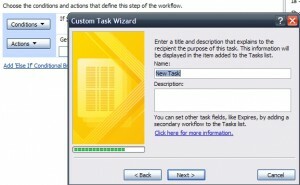 It creates one content type for any custom form that you create when collecting data from a task. Moreover, it doesn’t give you the chance to reuse an existing type….every new task is a new content type in the Tasks list. That’s it! 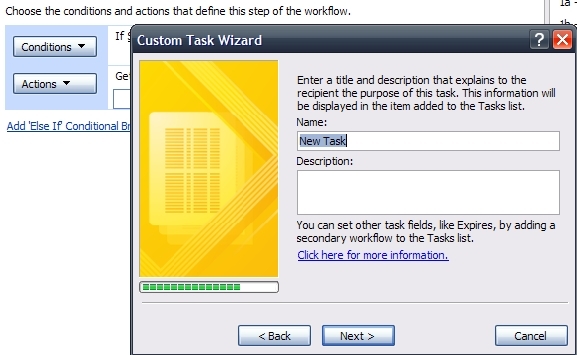 Now you can safely remove the DUMMY content type from the Task list and Site Content Types list.